From team meetings to workshops and seminars, the right surroundings make all the difference. Our prestigious meeting and event rooms in Leatherhead Surrey allow you to entertain clients at an iconic Grade II* property, where history and modern business sit side-by-side. We’ll give you the space to suit your occasion, from a single room to the entire ground floor. We can even tailor our services and stationery to fit with your requirements. Whatever we can do to help, we’re ready. All for just as long as you need, from as little as an hour, all just two miles from the M25, close to the A3, Guildford, Cobham, Weybridge and Dorking with excellent access by road or public transport and within easy reach of Gatwick and Heathrow airports. At Fetcham Park, events become occasions. Maybe you need a simple room for two people to have a discussion. Perhaps you’re looking for something a little larger – say, a canapé reception for 130 people. Whatever you need, we’ve got the perfect space for you for however long you need it. We’re here to support your business, so we’ll take care of everything. We’ll tailor the room’s layout to suit your event or, if more planning is required, just call on our experienced event management team to help you with everything from invitations to transport. All this means that you can concentrate on what really matters to your business – making sure your meeting is a successful one. With our meeting and events space, you can get as much space as you need, with essential services like catering and event planning. There’s no need to pay for a permanent meeting room that you don't regularly use, just book one of our rooms on a half-day or daily basis. Our meeting & event rooms start from £250 a day. 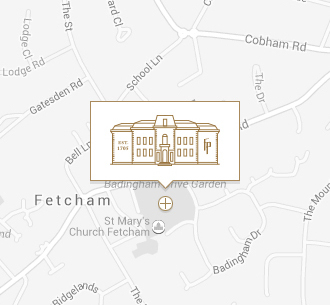 Fetcham Park Surrey is a tranquil space away from the city. But its location keeps you connected to the world of business. The historic market town and gateway to the Surrey Hills, just five minutes down the road. In easy reach via the nearby M25, or in less than 45 minutes from Leatherhead town centre by train. Both airports are within easy reach and less than25 minutes away by car.